HP, the world's number one laptop manufacturer, makes an enormous range of machines, including what they describe as business-rugged models. The EliteBook 6930p is one such laptop and is designed for use by small, medium and large businesses. The 14.1-inch produces a sharp enough image for reading and editing office documents. Unlike the Hi-Grade's screen, it doesn't feature a shiny Super-TFT coating, meaning there are no reflections in bright or rapidly changing light to worry about. HP's DuraCase technology is in evidence here and the laptop's chassis is made from a magnesium alloy, the hinges from metal alloy, and the palmrest and lid from anodised aluminium. The result is a sturdy, but at 2.4kg a surprisingly light, machine that provides protection for your data. This machine has also passed the same rigorous US military standard (MIL-STD- 810F) as the Hi-Grade, and can withstand drops from 2.9ft, sandstorms, vigorous vibrations and an altitude of 15,000ft. The keyboard is mounted firmly on to the magnesium alloy chassis and, although there is a little flex, provides a crisp and responsive action. HP has coated the keyboard in a protective substance to enhance the longevity of the keys, and it gives the board an almost rubbery feel. As well as the standard touchpad, a rubber pointing stick – located in the centre of the keyboard – with dedicated mouse buttons has been included and works in the same way as the Dell. Performance is only second to the Dell here, making it a better proposition - power wise - than the Hi-Grade, and you'll have no problem running business applications and software quickly and smoothly. As well as an optical drive with LightScribe compatibility, the machine has a 250GB hard drive. Not only can you carry around significantly more data and larger applications, but a greater degree of future-proofing is also provided, and you won't have to worry about regularly shifting data on to an external hard drive to free up space. As mentioned above, the 2.4kg the machine weighs is impressively light and the 422-minute battery life is also decent, and almost matches the Getac here. 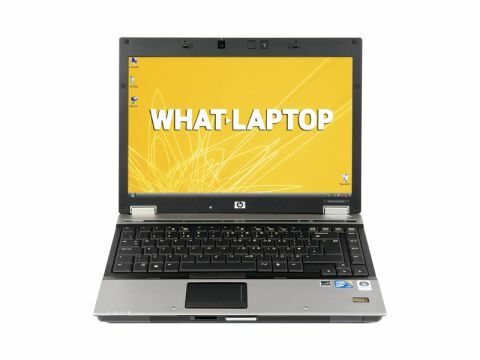 The HP EliteBook 6930p is a great business tool that boasts impressive rugged qualifications. It isn't as tough as the Dell or Getac, but it's not designed to be – instead it offers a successful mix of the regular and rugged and makes a great portable partner.